We've added many new members to our tribe! Welcome all, and thank you for joining us. We're almost to 5000 backers, and we have surpassed the final $300K Stretch Goal giving us these unique meeples! Thank you all so much for bringing this game to fruition in the best possible way. In case you're new, we've been having polls to decide which animal art would appear on different tiles. One of the Forest tiles got Dire Wolves, a Lake tile has a mysterious creature beneath the water, and now we are calling the third and final poll for the Giant Condor! I personally voted for this one, so I'm very pleased. This beautiful bird on a Mountain hex will be great to see. Thank you to all of you who participated in our Facebook Group and polls! Finally, the Kia Kia art is completed by Sergio! Just in time before the end. Now I can't decide which Tribe art is my favorite! All of our Stretch Goals are completed. The game is what we had always hoped for, thanks to you. Technically, you won't be getting anything new if you help push this campaign further, but if you have loved this project, if you want to be more a part of it, if you want to encourage campaigns like this one, then please share/retweet these posts and tell your friends in the final hours. Thank you so much! New Art and Stretch Goals! We can almost see the end of our great journey with 3 days to go! Welcome to all of the new tribe members we have picked up along the way. We just passed 4,000 backers this weekend! Recently we've hit Stretch Goals and Social Stretch Goals. We also have some new, exciting Stretch Goals to discuss and new art to show! We unlocked the Stretch Goal for a new Event and token for the Chieftain. The Chieftain event is shuffled in to the Events deck after the first village in the game is built. It is a unique single moment event; a resource bid for victory points (1 or 2 VP depending on total resources spent). The winner is awarded the token, and then must distribute the paid resources out to the other tribes, as they see fit. Our last Social Stretch Goal was unlocked and now we have these amazing Leader Meeples! Leader meeples are a variant/advanced rule in the game, after players are familiar with regular rules. They are build-able by all tribes once there is a village on the board, so be aware of this when you race to settle first. We are actively testing various scenarios where they have lasting effects over certain dice actions versus single once-per-game powers. We will update you with more information. We are excited that this community stood together and made these possible by completing all the social goals! It takes a village, indeed. Our Next Stretch Goal is new art for the Deluxe Box, plus animal art being added to the common tiles. The art for the Deluxe Box isn't final, but this is the direction it is going. You will be able to take the pieces out and fit them into the Standard Box if you want to combine them. Personally, I think the Deluxe Box will look great on my shelf! We've been running polls in our Facebook Group to determine which animals would be added to one Forest, Lake, and Mountain tile in the game. The first poll resulted a Dire Wolf being added to a Forest tile. Now we have the results of the second poll for the Lake tile. Anyone who was participating in the poll knows already, the mysterious shadow beneath the waters is our winner by a landslide! Finally, our Mountain tile needs an animal for when this Stretch Goal hits. For the mountain tile, we are bringing back the Cave Bear! It was nearly the winner in the first poll. Fighting the bear for the Mountain spot is the Woolly Rhino and the Giant Condor! Go to our new Facebook poll and give us your vote! As always, if you share the poll, your vote is counted twice! After the Deluxe Box Art and Animal Art Stretch Goal, we have one final Stretch Goal to take us home! Many of you have seen it on the page already, and we've been excited to bring it to you. The shapes of these are still being examined by the manufacturer to make sure they're possible, so these may change slightly, but these are close to finished. We have been eagerly waiting for Sergio to send us final art on the two tribes that were unlocked. Finally, the Danãnu! Personally, I think this might be my favorite art for the males. We have just updated information on both Brazil shipping and 8-10x of the 6pack to EU. For any and all shipping questions going into the final days, please check the FAQ, and then, if you have further questions, send Breaking Games a message. The final stretch Goal reached! You guys are amazing! We have so many new tribe members because of your efforts. On Monday we're going to have a mammoth of an update showing the Leader meeples, the next Stretch Goal, and a lot more! In the meantime, we got to play with the new wooden Mammoth! These prototype meeples don't have spears yet, so they just run in terror. It looks like the Forensic Scientists over at Grey Fox Games have discovered a Spear from the prehistoric era of Rise of Tribes! They've added a custom card based on Rise of Tribes to their current (but ending on Monday) expansion of Deception: Murder in Hong Kong Kickstarter! If you already own it and haven't seen the expansion's Kickstarter, or if you want both the game and expansion, head over there this weekend before the campaign closes. You'll have a special place in your heart for that spear as a tribe member! Have a great weekend! Come tell us what games you played in our Rise of Tribes Facebook Group! A New Animal Has been Selected! For those of you just joining us, we're running polls in our Facebook Group to determine a single animal that will be added to one of the basic tiles. This has no mechanic use, but adds to the theme. Also, different scenarios might make use of them. Dire Wolves! Apparently, winter is coming to one of the Forest tiles. Wow, what a close race! It came down to the 10 people who shared the post. Remember, if you shared the post, your vote counted twice. Now if you can't bare the result, keep watching, maybe a future poll will bring back your choice. For now, we're starting a new poll for a creature to be illustrated on one of the lake tiles! The Rutiodon (Giant Crocodile) is back. A Terror Bird is our second choice. Our third option is a mysterious shadow under the lake that will be difficult to make out, but it will inspire the tribes to create legends around it. Again, after you vote, if you share the post, your vote counts twice! This poll will close Sunday night on midnight PST. Many of you have asked about the support we'll use to carry out all of these orders. We've decided to work with Backerkit on this project. This means that we'll be able to provide better customer support and options after the campaign. We'll also be able to offer the game as a preorder there after the campaign, but, of course, not at the large discount our backers got. Backerkit allows us to finally give you the option to get two games. You'll be able to add on the second game in Backerkit once the campaign is over. The price is double the tier and shipping will be altered depending on your country. You'll be able to see the cost in Backerkit before making that decision. Thank you to all the loyal backers that have expressed interest in other languages! We want everyone to be able to enjoy Rise of Tribes. Printed Copies - We are starting a petition for full print copies in several languages. We need these forms to get out online and find out how many people would purchase the game in that language. We hope to hear from all of you who want Rise of Tribes in your own language. IF a game is made in another language, we've decided to consider those as first print runs in those languages that will include the promos. 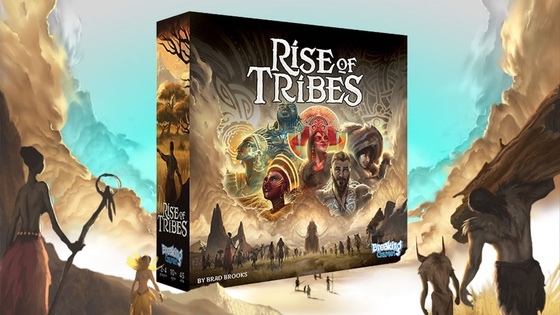 Welcome to all of the new tribe members, and also a big Kickstarter welcome to over 100 people who have made Rise of Tribes their very first Kickstarter project to back! That's overwhelming. We appreciate the leap of faith! Our latest Stretch Goal to be unlocked is the Jungle tile! The Jungle tile is for 'scenario play' or optional use. Suggested play is to replace one of the Forest tiles with this one during setup. It will count as a Forest for all card goals and events; however, a tribe must have 3 members to gather wood in this terrain. Be careful, and bring plenty of tribe members with you into the Jungle! Last Chance to Gather Wood Tiles! It's the last 20 hours for the Component Collector, and this is the only time you can get the Rise of Tribes tiles! If you want these exclusive trays, rush on over there and back them. We broke the Social Stretch Goal for Tar Pits! Now it will be one of the First Print Run promos that all of you get! The Tar Pit acts as a Lake hex, but of course food can be gathered here only if you are careful. If any player leaves only 1 tribe at this location, they are lost! You'll need a buddy system to survive in this ancient land! One more Social Stretch Goal to go, the 4 Leader Meeples! Head on over to the Facebook Group to see all of the awesome photos already posted. We need only 5 more Letter Tycoon images spelling out something to do with the Stone Age!